Helen Lorene Mason Richmer was born the daughter of F. Allan Mason and Elnora Fluhr Mason on August 8, 1932, in Evans Landing, IN. She died peacefully at the age of 86, surrounded by her family, on Saturday morning, November 24, 2018, at the Villas of Guerin Woods, in Georgetown, IN. 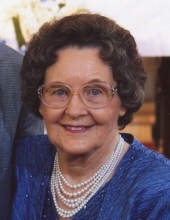 Helen was a loving wife, mother, grandmother, great-grandmother and a homemaker. She married Wilbur Richmer on August 22, 1953, at Most Precious Blood Catholic Church in New Middletown, IN, and they celebrated 65 years together. She is survived by her husband, Wilbur, and nine (9) children. Five sons: Michael (Bobbie), Donald (Debbie), David, Patrick, and John (Lori); and four daughters: Cheryl Bube Walther (Dale), Janice Richmer, Angela Galvez, and Nancy Spainhour (Glenn). Nine grandchildren: Jason Bube (Shelley), Nicholas Bube (Alexis Gaskell), Andrea Bube, Jennifer Spainhour Gordon (Scott), Katelyn Spainhour Wager (Chris), David Galvez, Daniel Galvez, Matthew Richmer (Samantha), and Alyssa Walther. Step-grand-children: Steven Coogle and Jessica Schnellenberger. Three great-grandsons: Evan Bube, Alexander Bube, and Logan Bube. Also step-great-grandchildren: Westen and Paisley Schnellenberger and Ella and Riley Gaskell.She also survived by one sister, Elsie Mason, and two brothers, Paul “Bud” Mason (Marylee) and James Mason (Benita). Helen was preceded in death by her parents, and two sisters: Margaret Coakley and Frances McCarty. Helen devoted her life to her family and she loved life. She enjoyed the gift of her grandchildren and great-grandchildren. She participated in the Senior Games, going to Derby Dinner Theatre, square dancing, family picnics, playing cards and Euchre. She especially enjoyed bowling. She and Wilbur bowled on a senior league for many years, and for 20+ years she planned our Richmer family bowling at Christmas time. She was an exceptional seamstress and enjoyed gardening. Helen loved God and was a devout Catholic her entire life. She was life-time member of St. Mary Catholic Church in Lanesville, IN, after she married Wilbur. Mass of Christian burial will be held at St. Mary Catholic Church on Wednesday morning, November 28 at 11:00 a.m. with burial at St. Mary’s Cemetery. Visitation will be on Tuesday, November 27, from 1:00 – 8:00 pm and on Wednesday morning from 9 AM to 10:30 AM at the Gehlbach & Royse Funeral Home in Georgetown, Indiana. The Rosary will be prayed on Tuesday evening at 7:00 p.m. at the funeral home. Expressions of sympathy may be made to St. Mary’s Catholic Church. To send flowers or a remembrance gift to the family of Helen Lorene Mason Richmer, please visit our Tribute Store. "Email Address" would like to share the life celebration of Helen Lorene Mason Richmer. Click on the "link" to go to share a favorite memory or leave a condolence message for the family.